Note how the head of this crimson clover plant is tipped over due to a lesion on the stem. Photo by Paul A. Koepsell, 1978. Cause A fungus, Kabatiella caulivora, that overwinters on diseased crop residue and may be carried on or in seed. The clover root borer also is a vector of this disease. Cool, wet weather favors disease spread and development. 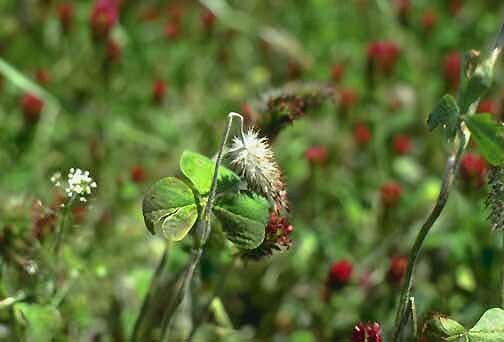 Many clover species are very susceptible. Symptoms The fungus causes brown, sunken areas on stems and leaf petioles. Leaves and flower heads usually lop over, presenting a shepherd's crook appearance, after which they wilt and die and break off easily. Cracking of stem tissues often is pronounced. Rotate at least 3 years with crops other than clover. Chemical control Seed treatment helps eliminate seedborne spores. Use inoculants after the chemical disinfectant and no earlier than 4 hours before planting. Captan 4F at 8 fl oz/100 lb seed plus a dye. Mertect 340-F (Group 1) at 8.7 fl oz in sufficient water to provide adequate coverage/100 lb of seed for only crimson clover seed production fields in Oregon (SLN OR-100014). Note Treating damaged or weak seed can reduce germination and/or seed and seedling vigor.